After getting to know the Tetrax Organ, profiled in my last post, I became interested in what other devices used banana jack interfaces for control voltage (CV) modulation. 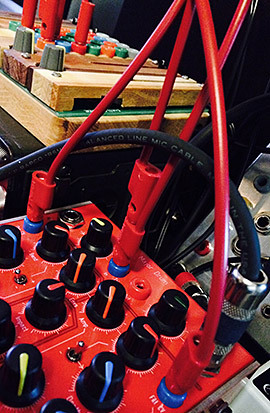 The eurorack standard for modular synthesis is wildly popular, but its buzz drowns out other equally interesting platforms, like the banana-based Buchla and Serge systems. 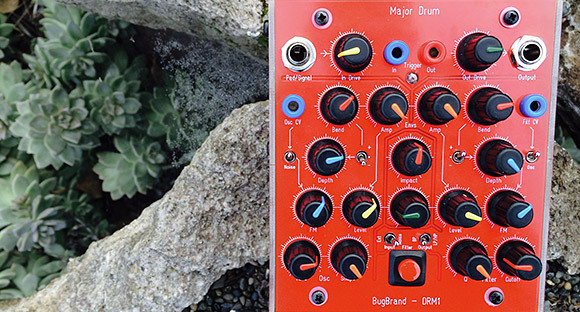 This research led me to BugBrand, a quirky English manufacturer of both modular synths and desktop formats (who also happens to be a top notch guy, not to be confused with The Bug, who I’ve been following since his first release in 1997, which is based on The Conversation, which is about a sound recordist…talk about circular references…). I had heard great things about, and from, his gear, especially a well-regarded but often-overlooked device called the DRM1 Major Drum. 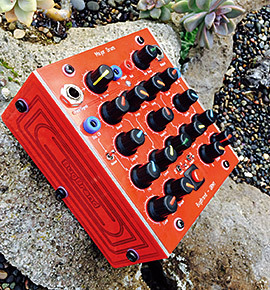 This filled a hole in my gear list: a dedicated all-analog, super-flexible drum synthesizer. And with a Tetrax Organ and a Low Gain Electronics UTL-1/2 format converter, I could easily drive it from pretty much any source that output CV. Hell, it even came in red, like my beloved Grendel Drone Commander. In short, I picked one up, and am thoroughly enjoying it. It mixes well with other gear, especially if I’m rolling all-analog. It overdrives naturally, aesthetically, and quickly, lending itself to aggressive styles, but not limited to them. I especially like the ability to create rising or falling triggered envelopes via the “Bend” feature. Having two trigger inputs (three if you include the big red button) and CV control of both its oscillator and filter are great. I do wish the filter was steeper for more extreme sculpting of the noise generator, but you do get the choice of bandpass or lowpass/highpass (the latter switchable with an internal jumper) via a front-panel switch. In all my research, though, I never really came across a single piece of media that really dove into its sound design abilities. While its tone can be varied a little based on the strength of the trigger signal it’s fed, it’s a single-voice synth, and no video demo or Soundcloud track really seemed to express its breadth of sound design possibilities. The sounds in today’s track are entirely made from the BugBrand DRM1. About half of the tracks are sequenced via the EHX 8-Step Program sequencer pedal (including the dubby melodic loop), and the rest are hand-edited, and one track features modulation form the Tetrax Organ’s touch pressure, and another using the Tetrax’s oscillators to drive the DRM1′s oscillator and filter. Effects include some delays, one reverb, and a bunch of high-pass and low-pass filters and EQ’s, with some compression on the output bus. The sounds all have a very strong flavor, sharing a lot of timbral qualities, regardless of the function they serve in the mix. That can be good or bad, depending on what you’re after. But still, I think it’s impressive that this is all from a device with only one oscillator, one filter, and only three CV inputs. And this thing has a truly massive frequency range: its lowest pure tones drop to at least 20Hz, and it’s pretty easy to get spikes near or above 20kHz! Pro tip: BugBrand products are tough to get a hold of, as Tom Bug doesn’t hold much inventory at any one time, so when he makes a production run, they sell out in a heartbeat. If you want to get in on Tom Bug’s next manufacturing runs/releases, get on his list.